Commenting on the second release from The Sean Baker Orchestra, Baker's Dozen, leader and guitarist Sean Baker said, 'My personal goal was to make 'the loudest, most aggressive, melodic, shredding, head-banging album on the planet' ... I really wanted this CD to be our Master of Puppets. Whoa! Now that is quite the goal, like climbing Mount Everest on your first attempt. But, you know what? I think SBO may have pulled it off: Baker's Dozen is pure unadulterated, full steam ahead, sack-thrashing, mesmerizing guitar work. The raw headbanging rippage begins with several aggressive and often heavy numbers in Dukes Of New York and the aptly titled Pummel U. Neo-Classical Gas lives up to its name with a sound dose of modern invention thanks to help from fellow labelmate and proficient shredmeister Joe Stump. Another heavyweight throws his axe into the ring as visionary guitarist Rusty Cooley joins in Vertical Skillz. SBO pays tribute to guitar aficionado and avid supporter Mike Varney on Mike Varney's Mexican Vacation. One can only wonder about the inferences within. For a little time travel, Baker and company cover Deep Purple's Highway Star, definitely in the top ten of my favorite guitar driven rock songs, in a way that would please Mr. Blackmore. Additional kudos should go to a song like Steve's Blackout which sounds like a six-string Niagara Falls rushing over you. It's not all acceleration and perspiration on Baker's Dozen when SBO ease up for acoustic 07/24/04 and Bach's 2 Part Invention in C Major. 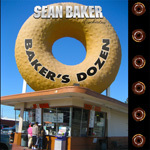 SBO's Baker's Dozen is blistering platter of monumental guitar virtuosity and shredding which is wholly extravagant and self-indulgent, but so very satisfying. Very recommended.